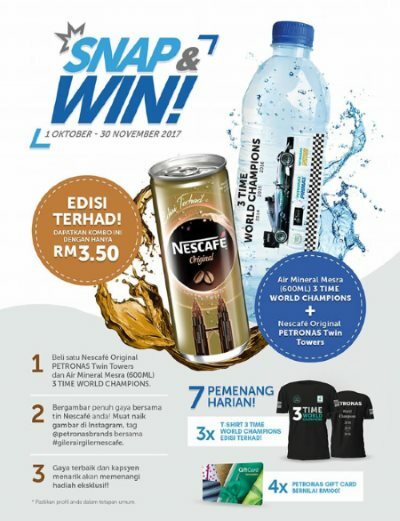 Purchase one (1) Nescafé Original PETRONAS Twin Towers 240ml Can AND one (1) Mesra 3 Time World Champions Mineral Water [600ml] from any Petronas outlets within the Promotion Period. Pose in the most creative way with the Participating Products and snap a picture. Upload the picture to Instagram and tag @petronasbrands with the hashtag #gilerairgilernescafe and your most creative caption. Contestants must set their Instagram profile to ‘Public’ in order to participate in this contest. Visit Nestle's Snap & Win Contest terms & conditions page for more details.